NWU engineering students came out in their numbers to attend this year’s fair that took place on 19 July 2018 at the Faculty of Engineering on the campus in Potchefstroom. 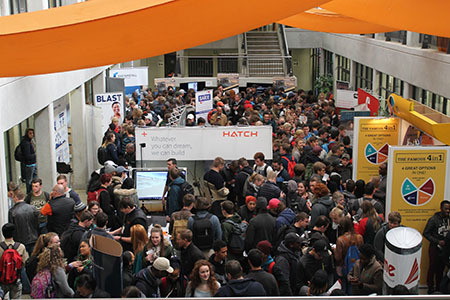 A total of 13 companies and organisations exhibited at this year’s event, exposing students to a broad array of career prospects within the engineering industry. According to Thoriso Maseng, manager of the Career Centre, the main aim of the career fair was to provide engineering students with the opportunity to learn more about career options related to their various disciplines. “The event also provided the exhibiting companies the opportunity to share in-depth knowledge about what the industry expects of graduates, as well as information about existing job and apprenticeship opportunities,” says Thoriso.